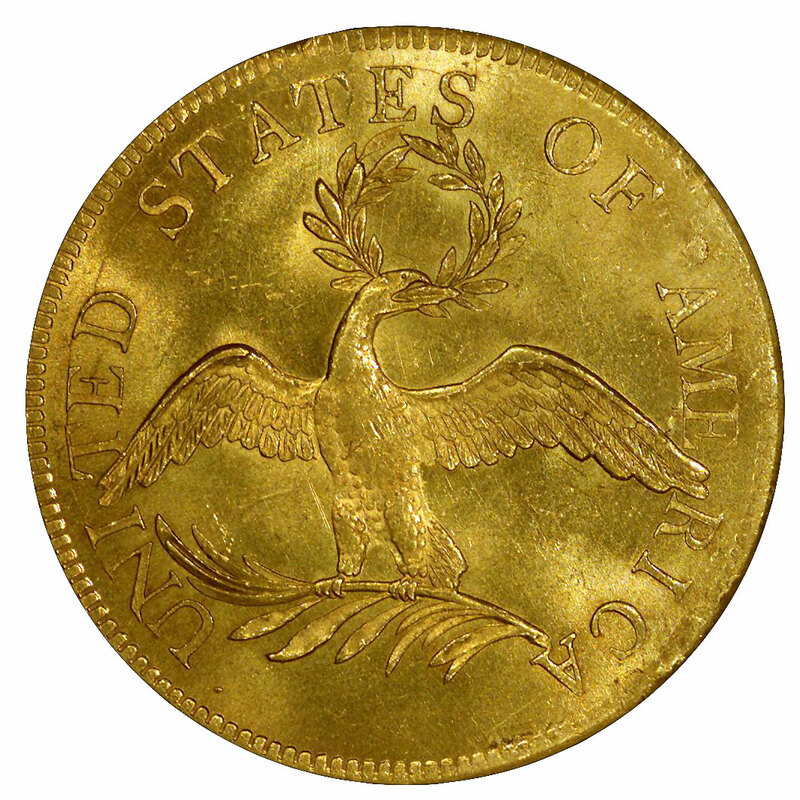 The eagle, or ten-dollar gold piece, was the highest denomination authorized under the original Mint Act of 1792. This was a very large amount of money at the time, and it was anticipated that only bankers and those engaged in international trade would likely use such coins. Because the Mint's assayer and its coiner were initially unable to post the bonds required for the handling of gold and silver, the coining of eagles was delayed until 1795. U. S. Mint Engraver Robert Scot created the Draped Bust of Liberty that graced this denomination from 1795 through 1804, excepting that no pieces were coined with the date 1802. His Small Eagle reverse, in which the national bird clutches a wreath in its beak and a palm branch in its talons, was used for less than two years. In 1797, it was transitional with the new Heraldic Eagle reverse. This is an adaptation of the Great Seal of the United States of America, in which the eagle grasps in its beak a banner inscribed E PLURIBUS UNUM while its claws hold, respectively, a bundle or arrows and an olive branch. Examples of any date in this series are very scarce, regardless of condition. Low mintages contributed to their rarity from the outset, but other factors came into play, too. As expected, many pieces were shipped overseas as international payments, and these typically were deposited at foreign mints to be recoined into that nation's money. 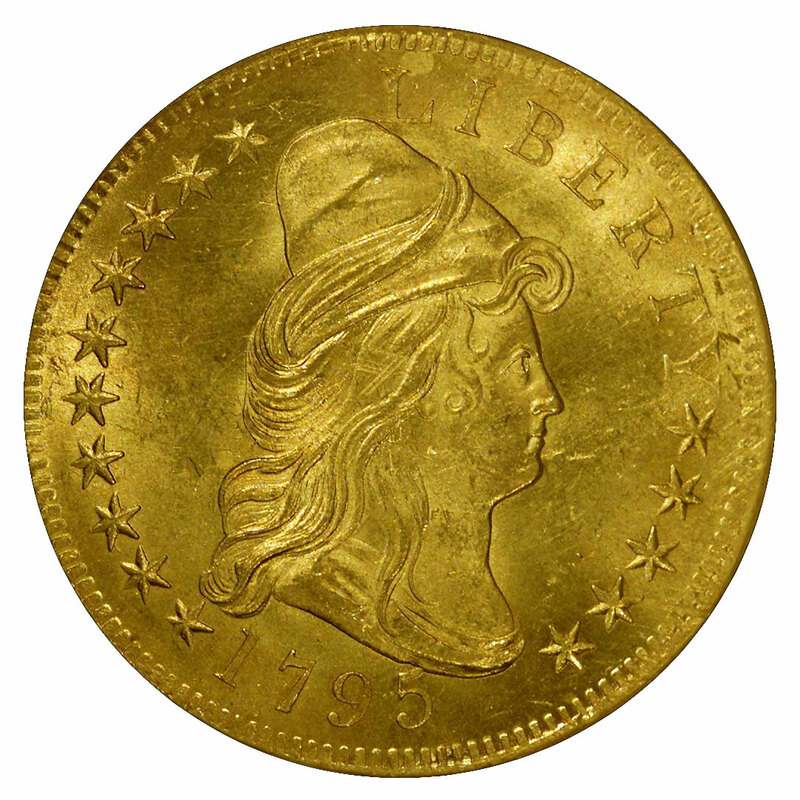 Accelerating this trend was the fact that United States gold coins were somewhat out of step with the world price of gold, their bullion value often exceeding their face value. 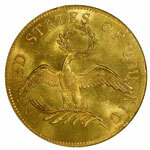 While all eagles dated 1795-1804 are thus scarce, certain dates are more often available than others. For the Small Eagle type, the most often encountered date is 1795. As many as a few dozen have survived uncirculated, though most are in the lower mint state grades due to careless handling over the years. More common are lightly worn examples, with very few pieces grading less than Extremely Fine. Within the Heraldic Eagle series, by far the most often seen date is 1799. Perhaps 100 or so survive uncirculated, with enough of these falling into the choice range (MS-63 to MS-64) that the advanced type collector shouldn't have much difficulty in securing one. The 1797 and 1801 eagles run a close second in overall availability, but the proportion of mint state coins is significantly lower. All remaining dates in this series are quite scarce in any grade and genuinely rare uncirculated. Due to their relatively low mintages, it is not unusual to find Draped Bust eagles that have prooflike or partially prooflike fields. For the dates made in greater numbers, examples are encountered having a broader range of luster. These dies gradually became worn, their surfaces progressing from prooflike to satiny, and then from satiny to frosty. Given the high cost of mint state coins of this type, most collectors will have to satisfy themselves with a worn example. As noted above, such coins typically are restricted to the range of Extremely Fine to About Uncirculated (this coin type saw very limited circulation). Most survivors will show signs of light cleaning, and such pieces are still considered certifiable by the major grading services such as NGC. Harsh or abrasive cleaning, however, will preclude a coin from being graded by the major services. Also seen on some coins of this type is evidence of tooling in the fields, re-engraved details and other mechanical repairs. Such work will also disqualify a coin from certification by the major services. Fortunately, for the collector seeking a Draped Bust eagle, this sort of work is more common on silver coins than on gold pieces. Certification of such altered pieces is still available from NCS, which uses non-numeric, details grading or provides simple authentication for those who don't want the problem issues addressed on the certification label. An ideal type coin would be one that is well struck, is either uncleaned or just lightly cleaned and is free of significant marks and adjustment lines (filing of the planchet at the mint to correct its weight). Such coins are very rare and will command premium prices over more typical examples.